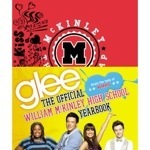 Get on your feet (it’s ok, no one is watching like they might have been when you saw it in the theater) and belt out the tunes when you watch Glee The Concert Movie (List Price: $19.98). 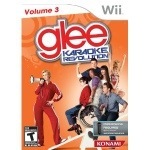 Channel your inner Rachel, Kurt or Mercedes will the karaoke games for Wii, XBox, Playstation or iOS. 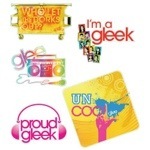 Glee stickers for your laptop, binder or any free, flat surface… I liked these and these (both $11, Amazon, image above and featured image). 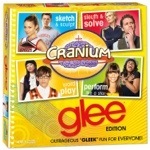 This iPhone 4 Most Likely To Case ($29.95, Fox Shop) is so cute and shows your Glee pride. 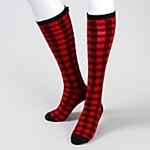 You too can be Ms. Berry with these houndstooth knee socks, a demure headband and ballet flats. 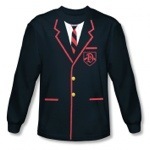 You’ve heard of a tuxedo shirt, here’s a Warblers Uniform shirt and it comes in both long ($29.95 Fox Shop) and short sleeve ($26.95, Fox Shop). Genius. UPDATE 7/16/2013: The sad news about Cory Monteith and the cause of his premature passing made me think about editing this original post, but that made me so sad. All that considered, I would be remiss not to acknowledge the loss of such an important character to the show, especially given the second sentence of my post–we may not know how things will work out, but we certainly know how it won’t work out. For those that love the show, I think there’s something very joyful about Glee, and this post was incredibly fun to research and write. 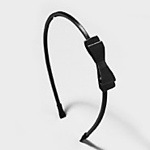 And, because I usually watch it with my daughter, personally, it connects us and a passion we share–namely, music and singing. So this weekend was hard and sad. Sad because I had to watch and hear her cry, and hard because I had to explain more (she has a general idea) about addiction and we had to have conversations I had hoped were a little ways off. Rereading this post, it made me smile again, and I hope it does the same for you. I forgot about that Warblers T-shirt, and suddenly, I have a hankering to play Glee Karaoke again… Maybe my daughter and I will have to do that tonight. Ya, I think that’s a great idea.